An aircraft landing at Naval Air Station North Island crashed into San Diego Bay on Friday, but the pilot was rescued by a civilian boat. The pilot of the T-45 based in Meridian, Miss., ejected before the plane struck the water around 2 p.m., according to Naval Air Forces Pacific public affairs. The pilot, who was not named, was conducting a routine training mission to prepare for aircraft carrier landing qualifications, according to the Navy. Fox5 San Diego reported that he was examined at Balboa Naval Hospital, but his condition was not available. “It was good to see the parachute — you’re just hoping he’s OK,” Sean Brady, a witness, told NBC7/39. Broadcast video showed the red-nosed aircraft in the water with the canopy missing. 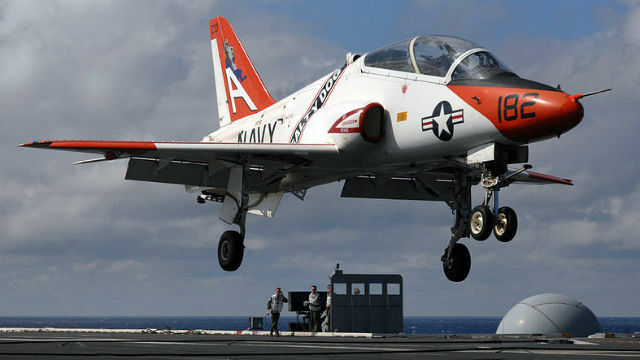 The T-45 Goshawk is a two-seat trainer manufactured by Boeing and BAE Systems, according to the website Naval-Technology.com. It entered service in 1991 and is capable of landing on aircraft carriers. The Navy said it would conduct an investigation to find the cause of the crash. — City News Service contributed to this article.